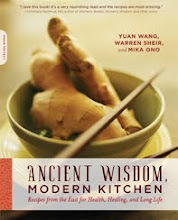 Ancient Wisdom, Modern Kitchen Blog: Ancient Wisdom, Modern Kitchen "Takes Off"
Ancient Wisdom, Modern Kitchen "Takes Off"
We're excited about the book's release on March 9! Labels: review magazine books "Publishers Weekly" "American Way"
I would love to carry this in my clinic for patients. I tried to find an answer to this elsewhere; do you offer wholesale pricing for bulk purchases to practitioners? Thank you. Thanks for your question, Vickii! Yes, wholesale pricing is available for 20 or more copies of the book. For an order form, contact Elizabeth Tabasko at Da Capo Press, Elizabeth.tabasko@perseusbooks.com or (215) 567-4691 or (800) 810-4145 x4691.